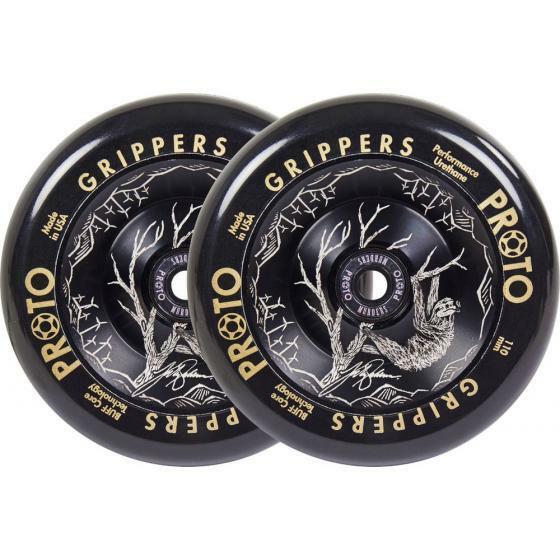 The "Slumped" Gripper wheels from Proto are signature edition wheels made with the well-rounded team rider Jake Sorensen. A combination of black, gold and white makes the wheels pop and with a combination of graphical elements that all pay tribute to his hometown around the Bay Area. The construction is based on a solid core with Buff-core technology which helps keep dehubbing at an absolute minimum. The PU is, as the title states, grippy and will provide pro scooter riders with a precise wheel. Sold here as a set of two complete wheels with the high-precision Murder bearings also from Proto. Ready to install, ready to bawl.